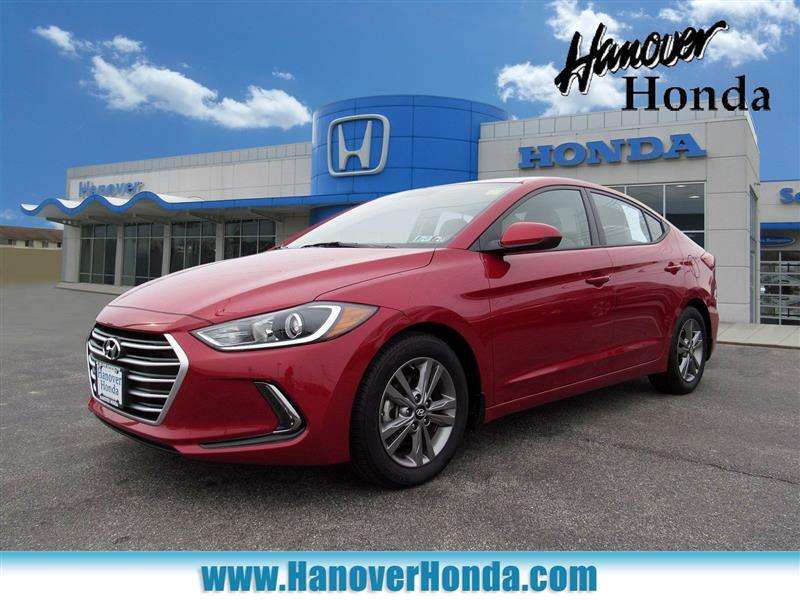 The equipment package you want and the power you need to combine in our stylish, Accident-Free 2017 Hyundai Elantra Value Edition Sedan brought to you in Scarlet Red Pearl! Enjoy the advanced performance of our innovative 2.0 Liter 4 Cylinder getting 147hp while perfectly paired with a sophisticated 6 Speed Automatic transmission. An ideal balance of power and efficiency, our sedan helps you score near 38mpg with the kind of smooth acceleration you dream about in our Front Wheel Drive!Don't be fooled by the words Value Edition, because the value is in the extensive list of equipment Hyundai has packaged together. A step up from the base SE model, the Value Edition adds must-have features such as a power sunroof, power driver seat with lumbar support, a compass, and an auto-dimming rearview mirror with HomeLink. You'll also appreciate power locks/windows, dual-zone climate control, proximity key with push button start, and display audio with AM/FM/HD, available satellite radio, and smartphone integration. Just imagine yourself behind the wheel... Enjoying your daily commute!A Top Safety Pick, our Hyundai Elantra also rewards you with peace of mind thanks to blind spot detection, lane change assist, high strength steel side impact beams, seven airbags, ABS and a Vehicle Stability Management system. Safe, stylish, and efficient, our Elantra certainly stands out from the competition and is an intelligent choice for you! Print this page and call us Now... We Know You Will Enjoy Your Test Drive Towards Ownership!